I’m sure there’s a fancy name for them somewhere, but that information eluded me in my half-hour search of the internet…so here they are anyway, just sitting there prettily along the side of the trail in Millcreek Canyon. This entry was posted on August 7, 2012 by seekraz. It was filed under Photos - Outdoors and was tagged with Desolation Lake, hiking, Millcreek Canyon, mushrooms, photography, Salt Lake City Utah, Utah mushrooms, Wasatch Mountains, Wasatch National Forest. Well, the one on the right is Harry, but his friends call him “nospore”. Next to him is Nadine; she can be a real bi . , , pistol, but the rest put up with her because she’s been around and knows the in-crowd. Then there’s Peter . . . you can see him, as usual, trying to hit on Paul. The two headless ones are ex-soccer players; we don’t know their names because . . . well, they’re headless. 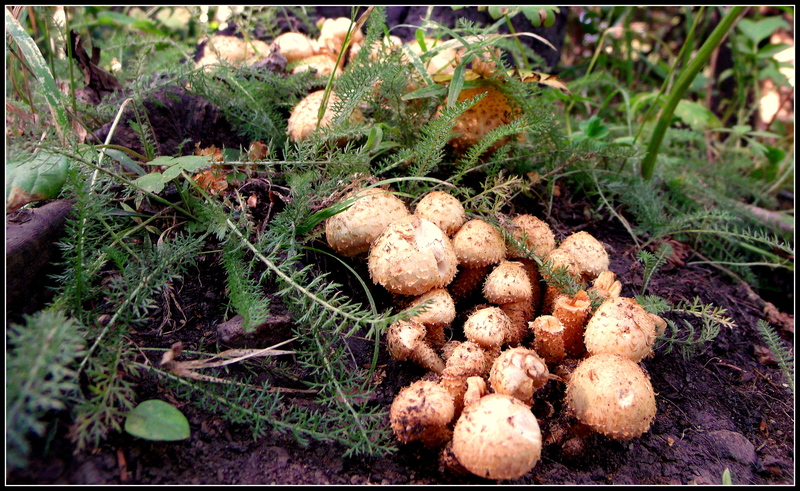 They bear a resemblance to the Lactarious group (http://www.rogersmushrooms.com/gallery/VisualKey.asp), but could not be bothered to go through all of them. Nice pictures. I had thought about Harry and Nadine, but was at a total loss for the rest of them, so I didn’t even bother to begin with the names, Emilio…so thank you for filling-in there. I appreciate the link, as well…who would imagine that there could be so damn many of them…. 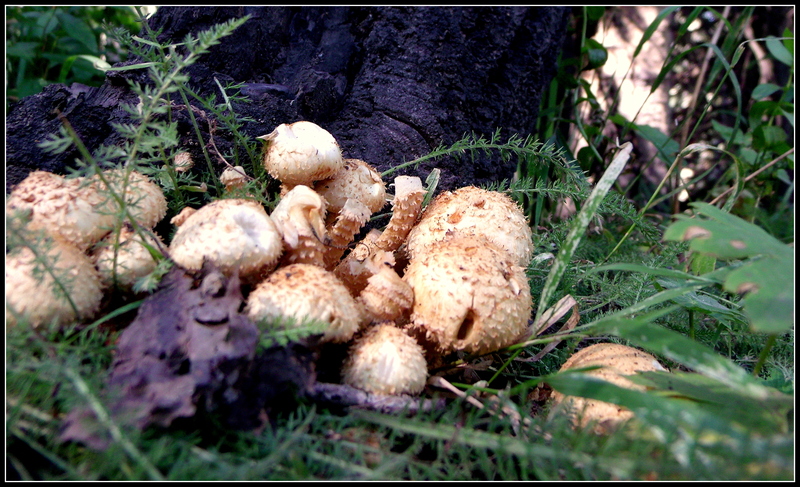 Wish I knew a bit more about mushrooms…often see them on my walks but not sure if they are edible or not!! I did a little bit of digging (pun not intended :oops:) and I think they might be honey mushrooms. They are edible apparently but I’d need to be pretty damn sure before I tried them. 🙂 Lovely pictures Scott. There sure is, Meanderer…they’re so earthy and can add so much to a dish or meal, but the tucked-away thought of their potential for harm seems to remain, especially when seen out in their natural environment. Your Coconut Mushrooms sound wonderful…maybe like Macaroon cookies? More treasures from your walks. Thank you for sharing them. I love ‘shrooms… 😉 So nice of disperser to introduce us. I think these might be wood mushrooms (Agaricus silvaticus) but the only way to be 100% sure is by taking a spore print of one. I always err on the side of caution with mushrooms and assume they’re poisonous until I’m absolutely sure they aren’t. Perhaps Scott could do a taste test. A minute amount would not be enough to kill, but any adverse reaction would point to them being edible or not. To do a proper test, feed it to any of the current batch of politicians. They look quite unusual, at least from the ones I see here. It was my first time seeing them out here, Terry…and right next to the trail, too. What a great find, they look good. Are they edible? They do look good, Leanne…but I have no idea if they are edible or not. I will leave that to the experts…and still get my mushrooms at the grocer’s. Beautiful! Don’t seem edible somehow.